Located in Pittsboro off N.C. 87 are just under 16 acres soon to be dedicated to rescuing farm animals. The place is called the Piedmont Farm Animal Refuge, and it’s Lenore Braford’s way of fostering her love of animals, educating the public about the harms of factory farming and providing support for those who want to know more about where their food comes from and the vegan lifestyle. Braford hopes to open the refuge within the next month. The Piedmont Farm Animal Refuge will be a sanctuary where rescued farm animals will come to live out the rest of their lives and the public can come for education. While the organization’s name – including the words “farm animal” – might confuse people to think it includes horses, the animals there will primarily be those in factory farms that are eaten, like chickens. Due to space limitations, larger animals will be limited. “We are probably going to fill up very quickly because we do not have that much land,” Braford added. At this point the refuge consists of nothing but space, as there are no animals yet on the 16-acre farm. To fill the refuge, Braford hopes to receive animals from a variety of places such as the animal shelter and factory farms or stockyards. Braford anticipates getting animals typically referred to as “downed animals” from factory farms and stockyards. A downed animal is a farm animal that lives in a stockyard and has something physically wrong with it. Typically, these animals are seen by the industry as costing more then they’re worth and are killed, when often they just need simple medical care to get back to good health, Braford said. “I have always had a love for animals, and once I kind of learned about factory farming and what farm animals go through, I knew I wanted to be involved in something like this,” Braford said. To get involved with a farm-animal rescue organization, Braford realized she would have to start one herself. Although she did not study agriculture – instead graduating from Oberlin College with a degree in environmental studies – Braford begin doing internships at animal sanctuaries and wildlife rehab centers to understand how they operate in preparation for opening her own refuge. Through an internship at the Carolina Tiger Rescue, where she currently works, Braford learned about how nonprofits run. “There are a lot of people here who have supported me and are my mentors here,” Braford said of Carolina Tiger Rescue. 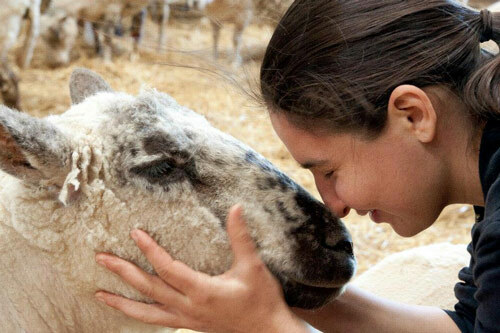 While Carolina Tiger Rescue was able to teach her about running a nonprofit, she knew she wanted – and needed – to learn more about running a sanctuary specific to farm animals, and to do that she went to upstate New York. Farm Sanctuary New York is 175 acres where hundreds of animals, from cows to pigs to chickens, are cared for while thousands of visitors a year come to be educated about the animals’ lives and factory farming. In the future, once the refuge is filled with animals, Braford hopes to have an on-site kitchen to host food events and vegan cooking classes to help people understand the connections between their food and the source. Lenore, would you consider a couple of vet tech students to come see your sanctuary and do feeding and watering? Hey there, I would love to work with you and help. We have a rescue in Pittsboro (Turtle Pants Farm) and we take in all sorts of things (dogs, cats, horses, peafowl, goats, ducks, etc). There is also Red Dog Farm in Greensboro. Please email me so we can work together to save more. I strongly encourage you to contact Tysor Vet in Siler City. She is a large and small animal vet that supports rescue. I am thrilled to read this article!